This is a neat horse riding game! In this game, you can do cross-country and jumping. You can also do lots of other horsey things such as: choose and select different horses, dress up your character, gallop everywhere, jump whenever and wherever and take care of your horses by feeding and grooming them. This is probably one of my favorite Wii games. I really enjoy exploring the island with my horses and training in the two arenas and various show jumping courses. To buy items (tack, riding hats and clothing), you have to collect horseshoes and apples, as well as camp credits. And I quite like brushing, watering and feeding the horses too! Is this the game where you save the baby horses? This game was my favorite game. 5 STARS!!! I like this game because you can play it both on the wii and the wii u. So how can you love a game so much, just play this game and find out! Hey, i just saw this game in a video club and i wanted to buy it, but my dad said no, because it is for babies and i am twelve. Should i go buy it now that i have gathered enough money? I am not sure. It sounds fun, but i am afraid i will not like it because it is with barbie, you know. this game is fun but I wish you could breed horses. I also wish you could own more than one horse at a time. I love this game so much! It's so fun and entertaining! If you have not bought it, I recommend that you do. This game is fun but I wish that you could feed your own horses and groom them and I also wish that it could be more realistic. I want star stable! I really really want it!!!!! My friend has recently told me about this game. I have a few questions before thinking about the purchase... Can u customize your own character? Can you play with other people? how do i get it free on my computer? i can't figure it out! this game is fun, i'm 10 and i think this game is fun, but i think it would be a little more fun if you could actually groom the horse and actually give your horse hay. sorry for the misunderstanding but i actually changed my mind this game is super fun. i would say that i still like my horse and me, a little bit more than this awesome game! but i still say that the challenges are too easy. this game is fun but the missions are too easy. i like my horse and me better than this game. this game is the best game that played on will! I did really like the game but it seemed a little too short but the best thing about the games was that you had all the freedom in the world, you could do almost anything with the character but other than that it's fun. i have this game and it is really fun but sometimes the challenges are kinda easy but this game is really fun. i never played this game, is it good? Ich find das spiel cool,aber kann mir vielleicht jemand sagen wie Barbie die pferde nennt? 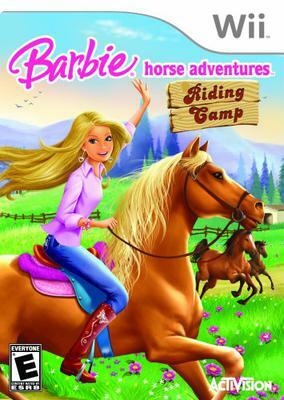 I find the game cool, but can someone tell me how Barbie might call the horse? no idea how to jump on the PC? This is an awesome game to play! my sister and i are always joking around at how kyle has a big crush on barbie! If you have the DS game that is WAY different then the wii one (trust me, ive played it on my BFFs DS. this is an awesome game, i think that you should play this awesome game! i own this game and this is AWESOME. You get to groom your horse and ride it. there are many challenges you can do. this game could be for young horse crazy girls and older, it can introdue people to the horse world. I love this game except how easy it is. good game though!!!! This game is the funnest game I have ever played! It was hard to pick just 1 because I love all horse games and want to buy all of them! In this game, you can ride horses, race against other riders and the best part is , you can ride your horse on the beach! I highly recommend that you buy it! I love this game!!! But I wish you got to name your horse and be able to pick better tack! But the story was awesome, I did not want the game to end!! The first horse you get is very hard to control. I love horses, but sadly do not own any. I wish that for just one week I could own a horse and take care of it and love it and train it . I'm 13 and borrowed this game from my 6 year old cousins for my 5 year old sister.Soon, I started to play the game and it is actually pretty fun!! I do wish that you could actually groom the horses though. You earn ribbons so you can earn horses. It is very detailed and scenery is great! It isn't to hard to control the horse either.